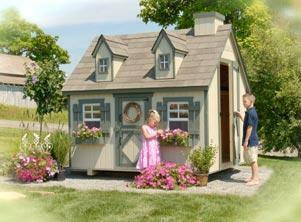 When you choose one of our quality Playhouse Do-It-Yourself (DIY) Kits for your child, you are opening the door to his or her imagination. Whether they pretend to be an architect or interior designer as they decorate their new home, a librarian in their new reading room, a fireman in their new firehouse or a doctor or nurse in the hospital they just created inside their new playhouse, the possibilities are endless! You will be helping your child’s imagination grow while creating those memories which will last a lifetime! Our children’s playhouses give the kids a place to get away, give you the extra space you need and add to the beauty of your home! Cape Cod Playhouse kits are roughly 6’ high and come in five sizes.